The Alera Elusion Series Mesh Mid-Back Swivel/Tilt Chair comes in black 100% polyester upholstery. This padding makes this Alera Elusion series chair very resilient. In addition, washing or cleaning of this chair is made easy due to the ability of the upholstery to quickly dry up. Furthermore, this premium fabric tends to be resistant to biological destruction or damage like mildew and mold. This easy to wash fabric is also able to hold forms, however, it is also very flammable, and so you should avoid flames near this chair. The Alera Elusion Series Mesh Mid-Back Swivel/Tilt Chair features a pneumatic lift that functions to adjust the height of the chair in order to accommodate different users of different heights. The chair can adjust from a height of 18-1/8 inches to 21-3/4 inches. This chair has a cushion with waterfall edge that helps relieve pressure on your legs. This enables you to rest your legs comfortably while seated in this elegant chair. This chair has a multi-function mechanism that features seat glide to allow the back angle adjustment of the seat. The chair can also swivel or tilt freely in 360 degrees thanks to its infinite or free-rotating locking positions. The chair has a mesh back that has been designed with lumbar support that makes your back rest against a slightly firm support. The cool and breathable mesh back is padded with 100% polyester to give it the durability required of such an ergonomic chair. The arms of this chair are adjustable in height and width and are very softly padded with polyurethane pads. The seat is covered with a contoured cushion that is also padded with this premium fabric and completed with a black polish to provide you with great comfort. Other notable features of this mid-back swivel chair include a five-star base fit with hooded dual wheel casters of 2 inches in size for ease of movement. This Alera Elusion Series Mesh Mid-Back Swivel/Tilt Chair can carry a weight of up to 250 lbs with its seat size of 20-1/2 inches by 21 inches and back size of 20-1/8 inches by 34 inches as well as an overall height of 36-5/8 inches to 42-1/2 inches. The chair has an ergonomic design to easily fit multiple users. The back is made of mesh for sound comfort. The chair has a breathable back with lumbar support. The contoured seat cushion and its polyester upholstery together with the chair’s waterfall edge help in relieving pressure on legs. The height of the chair can be adjusted to fit different users. This ensures that people with different heights can easily adjust the chair. The arms of the chair can be adjusted both in width and height. Easy to assemble. You can easily put it together with no help. Some users have complained about the assembling of the chair, with most citing the lack of instructions as a major problem. However, the manual comes in pictures which can be quite helpful as well. Besides this, the Alera Elusion series mesh mid-back chair offers top quality comfort. If you spend more of your time on a computer, this chair can provide you with the comfort you need during these long hours. The adjustable height feature of the chair suits multiple users and the comfort of the contoured cushion is unmatched. 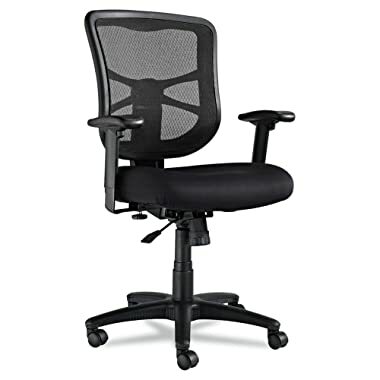 This is a great chair for both office users and telecommuters who spend long hours on computers. Buy It Now on Amazon.com and enjoy the comfortable life. Customer Reviews on Amazon.com for Alera Elusion Series Mesh Mid-Back Swivel/Tilt Chair.